Bill C-27, an Act to amend the Pension Benefits Standards Act, 1985, a bill that if passed would allow for the retroactive conversion of defined benefit pension plans to target benefit plans for federally regulated employees, including our Unifor National Council 4000 members in the rail industry, has been met with much criticism from unions, workers and pensioners. This criticism has seen the Federal Liberal government agree to "freeze" the bill pending further consultations, but this freeze is not a withdrawal of the bill. It is simply a freeze pending consultations. Union representatives from Unifor National Council 4000 have reached out to Finance Minister Bill Morneau and various Members of Parliament to express our deep concerns over this bill, which was introduced without any public notice or consultation with Canadians, pensioners, or unions. 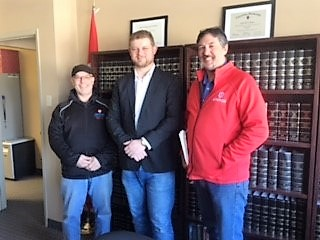 Dave Kissack, Unifor Council 4000 Regional Representative, along with Fabien Bisson, Unifor Local 4002 Chairperson for VIA Rail Agreement 2, met with Daniel Blaikie, New Democratic Party Member of Parliement for Winnipeg Elmwood/Transcona on March 1, 2017, talking for two hours on their shared concerns with Bill C-27. Mr. Blaikie is adamantly opposed to this bill. "It was nice to meet with an MP who was actually on our side on this issue", said Kissack. "Mr. Blaikie said he is going to keep us informed as to where the bill stands and we plan on working together in the future in order to advance our campaign to defeat this bill. It has been sent back for further discussions, but that does not mean that the bill has been rescinded so there is still work to do", explained Dave Kissack. Kissack and Bisson met previously with Liberal MP for Winnipeg St. Vital/St. Boniface Dan Vandal on on January 16, 2017 to discuss their concerns with Bill C-27. Below we have shared the editorial from Daniel Blaikie on Bill C-27. How would you feel if you paid into a payment plan for twenty five years expecting to receive an asset, only to have it taken away at the end of the payment plan? Banks should never be allowed to change the terms of a deal at the end, and employers shouldn’t be allowed to either. Yet, the Trudeau Liberals are proposing to allow federally regulated companies to do exactly that to hundreds of thousands of pensioners with defined-benefit pension plans across Canada. These pensioners spent decades paying into a pension fund in good faith on a promise that they would receive a defined, secure payment out of the fund during their retirement. They built their lifetime financial plan based on that promise . . . and they don’t have the option of starting all over again. Bill C-27 would allow employers to pressure their workers and retirees out of their defined-benefit pension into a ‘target-benefit’ plan. A target-benefit plan takes away the legal responsibility of employers to ensure a secure pension if the plan`s investments are underperforming. A defined-benefit plan instead requires increased contributions by the employer to secure your pension. In other words, all the risk of bad investment gets loaded onto the pensioner and the company is left totally off the hook. While the pensioner’s consent would be required to transition the plan, we know employers have tools at their disposal to push people toward the outcome they want. For instance, they could use the carrot of a one-time lump-sum payment to those who transition, or they could raise fears about the solvency of the defined-benefit plan to scare people out of it. Bill C-27 will let employers wipe billions of dollars in pension liability off their books, while pensioners who thought they were set for life are left wondering if they have enough saved up to pay the bills. Once the precedent is set, provincial governments may decide to do the same. Pension promises must be honoured. The Prime Minister understood that during the campaign when he said: “[Defined Benefit Plans] which have already been paid for by employees and pensioners should not be retroactively changed into [Target Benefit Plans].” Unfortunately, he seems to have forgotten his promise. Bill C-27 represents a serious attack on pension security in Canada. The government has no mandate for such a sweeping, destructive change. Let your MP know you want to stop Bill C-27. ​We will have more on Bill C-27 and the work that representatives of Unifor Council 4000 and our Regional Local Unions are doing in challenging this bill, in the coming days ahead.